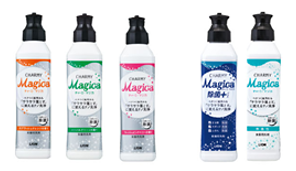 Lion Corporation (President: Itsuo Hama) announces the March 16, 2016 nationwide release of Magica Antibacterial + (“Plus”) and Magica Unscented, two new additions to the Magica dishwashing detergent brand that meet new customer needs. Lion released Magica dishwashing detergent in January 2015. Thanks to the product’s excellent detergency, which makes grease slide off dishes like water, 2015 sales of Magica reached 129%1 of sales of similar products in the previous year (based on total sales for January through December 2015). Stimulated by the release of Magica, the dishwashing detergent market as whole also grew 5%1 year on year (based on total sales for January through December 2015). In recent years, approximately six in ten consumers have expressed a preference for antibacterial dishwashing detergents with many seeking detergents that offer antibacterial effects strong enough to kill germs clinging to items like cutting boards and dishcloths. To meet this demand, Lion is now releasing new Magica Antibacterial + (“Plus”) with heightened antibacterial power that eliminates germs from not only sponges but also such items as cutting boards and dishcloths. At the same time, approximately 15% of consumers actively seek out dishwashing detergents that present no detectable fragrance (2015 Lion survey). 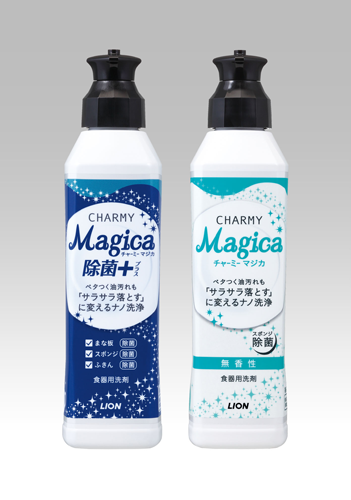 To meet this demand for reduced-fragrance and odor products, Lion has developed the market’s only unscented detergent formula.2 This new product, Magica Unscented, is now being released. The Magica product lineup uses nano-cleansing technology to make stubborn grease slide like water off dishes. By adding two new products with features that meet additional consumer needs to the lineup, Lion is helping consumers achieve even quicker, more effective cleanup. With even stronger antibacterial properties than previous Magica products, Magica Antibacterial + (“Plus”) fights germs not only on sponges, but also cutting boards, dishcloths and other items. 3. Does not eliminate all bacteria. The unscented formula4 is designed to suppress the odors produced by detergent ingredients to ensure that there is virtually no detectable odor when the detergent is squeezed onto a sponge or during cleanup. * “Unscented” here refers to the absence of detectable odors or fragrances, regardless of the use or non-use of added fragrances. This is distinct from “fragrance-free,” which refers to products that contain no added fragrances, regardless of whether they present a detectable odor. * Refill packs (containing enough detergent to refill the bottle approximately three times) and large-size refill pack (approximately five times) are available for all the above products. No Magica products have a recommended retail price. Magica uses proprietary nano-cleansing technology to break up grease to the nano level so that slimy residue on dishes from grease slides off easily and washes away. Red-tinted grease5 was applied to a plastic6 sheet, which was then submerged in a solution of water containing a concentration of dishwashing detergent approximating that found in the bubbles that arise during normal dishwashing. The grease was then observed. With the previous Lion product, grease sticks stubbornly to the plastic and little detaches to float upward.